This case examines mercury bioaccumulation and biomagnification within the context of the human health impacts of ingesting food (specifically, fish) contaminated with mercury. It was inspired by a 2009 USGS report on mercury in fish, sediment, and water from streams across the U.S. 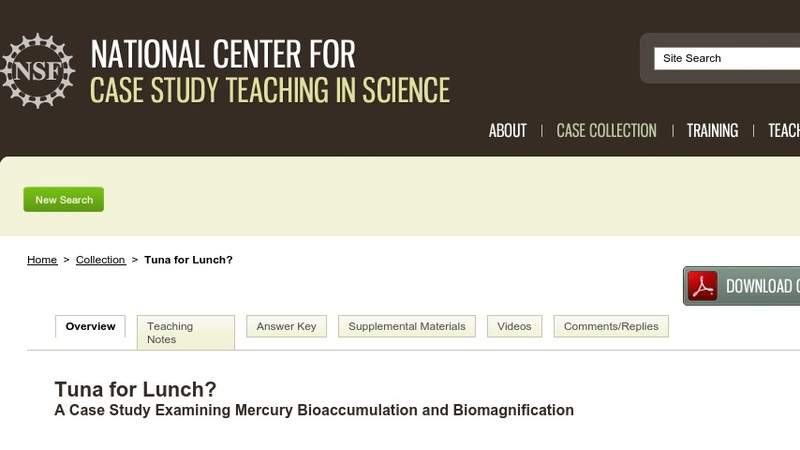 The case is intended to help students make the connection between an environmental contaminant (mercury, a neurotoxin) and the food they eat. Human activities have been increasing mercury concentrations globally, and coal-burning power plants are the most common source of mercury pollution, a fact many students are unaware of. The case has been used in an introductory level environmental science class (predominantly non-majors), a non-majors general biology class, and a sophomore level ecology class (majors).